Once you click Navigate button, it navigates to the ComponentTwo. 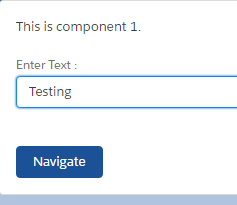 Check whether you created both the components. I'm trying to set this up, but in a community (I am using the implements="force:communities..." The components both display, but the events are not firing. Is there another step I should take to run this in communities? I am attempting to implement this in communities (implements="force:communities..."). While the components are visible, the events are not firing. Any idea why? Make the event as APPLICATION event and try.